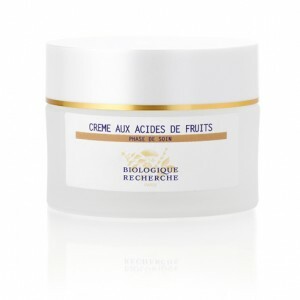 Crème aux Acides de Fruits is a 1-month intensive treatment cream, which softens and purifies the skin. Formulated with a Fruit Acid Complex to moisturise, and cellular oligopeptide of amniotic fluid to regenerate, this product containing AHA’s and Natural Moisturising Factors, will enhance the regenerating, moisturising and revitalising effect on the epidermis. This powerful exfoliating cream is ideal to use as a boost on the skin during times that it feels very devitalised or dull, or it could be used to target scarred tissue and uneven skin. Your skin will feel softened, brighter, hydrated and purified. Devitalised, pigmented, dull and/or oily Skin Instants®. Moisturising and purifying agents: Apple, Grape, Ginger and Sugar Cane Extracts. Fruit acid complex: Alpha-Hydroxy-Acide (AHA), Natural Moisturising Factors (NMF).